trough a post on here last week, i was introduced to the SSS – Sane and simple crypto saving plan. It's a clever idea and functions well but it isn't perfect. For those flaws i have come up with a solution. It will not be perfect, because nothing is perfect, but it will solve those given problems to an extend. Let me explain it to you, maybe i can convince you to follow this plan and maybe hopefully leading you to getting more out of your crypto. Note: You only need to apply the red numbers to your liking/starting conditions. The black numbers are calculated automatically. Last cycle high: Here you enter the last ATH, its the number on what we predict the grow potential. Volatility High: Here you enter the factor with what you think the asset will grow. If you are sure that we will never reach ATH again, set it to something under 10. Volatility low: This number is calculated off the vol high number. It assures that we start selling before we reach the estimated new time high because we still want to take profits out and we want to buy in lower when we get the chance. Estimated new high between x…x: Here the potential new highs are listed based on your assumptions. It isn't a danger when we don't reach those numbers or we go above them because we only sell a little every time and we start selling when we reach the lowest estimated new high! Estimated new low between x…x: Here are the potential bottoms listed for those high scenarios. If we dropp further, it's not danger because we allready took out our profits and bought back in all the way down for less money! Buy in till price x: This is the price at what point at least you want to be in the market to be able to get good returns. The earlier you buy in or the more down your DCA price, the better, obviously! After that price is crossed, i will personaly not accumulate more coins. But to each there own. Note that after every cycle, when the next bear arrives, you can use this sheet to recalculate those numbers and reinvest more money! Maybe the money from rebuy orders which didn't got filled in the last cycle. Number of your coins: Here write in the number of your starting coins or the number of coins you want to invest with this sheet. You can still hold a part of your stack, even tho you will never sell all with this sheet. Money invested: Here write down the amount of money you have invested into the coins. The sheet will calculate your profits based on this. Rebuy price = …% of sell price: Here comes the rebuy order to the game. Every time you sell coins based on this sheet, you cash out 50% of the money onto your bank account. With the other 50% you set limit orders to rebuy at a fixed % of the sell price. I use 33% because from studying last cylces, the crypto assets always fall between 70-90%, so with this number you buy back at 67%. You can change it to anything you are comfortable with. Even 50% works! Percentage start, resume and the coefficient: Those numbers are the magic. They make sure, that the gaps get tighter the nearer we are at the estimated top high and get wider the more we go from it after that. It makes sure, that the gaps between the selling numbers aren't to big to risk a potential wide gap to the top when it arrives. I have played long with those numbers and used different scenarios to determine what numbers are perfect. Those them are! You can play around with them for yourself tho. Sellorder at this price: Here you read at what prices you sell your coins. I only left the coins for the next 2 selling orders at the exchange, i advise you to do the same. Set limit orders and deposit coins and set the next limit order every time one sell order is hit. Number of coins to sell: The number of coins you sell at this sellorder. You see, that the closer we get to the estimated high top, the more coins we sell. At the estimated top high we will sell 5% of the stack. The orders before and after that will sell 5% less every time. I choose 5% as basis because we are early in this asset and we will see huge growth in the future. I don't want to sell 10% or more of my stack at one price now. Maybe this time arrives in a few years, but you can change it to your liking even now. Number of your coins after sell: The number you have left, after this particular sell order gets hit. Rebuy order at price: Here you see at what price level you set your rebuy orders. Set and forget them after a sellorder gets hit. 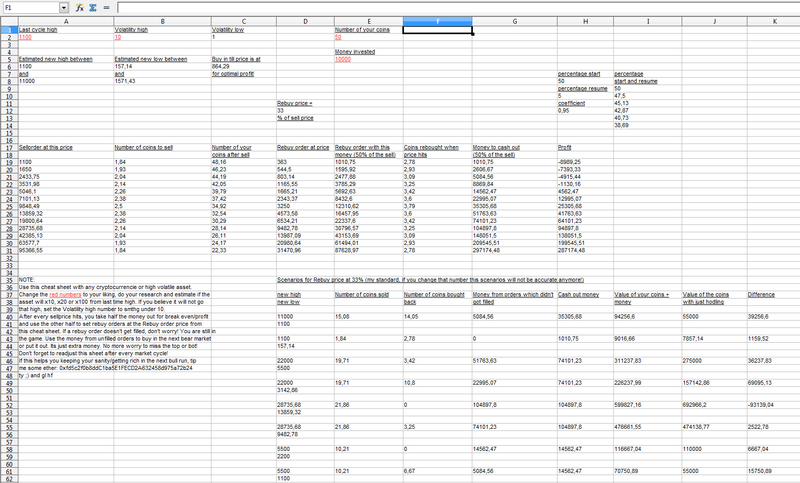 If the next cycle is over and some rebuy orders didn't got hit, you can use that money for DCA based on the new numbers from this sheet when you re calculate it. Rebuy order with this money: Here is listed, what amount of money you put in this rebuy order. It will always be 50% of the money you have got from the sellorder. Coins rebought when price hits: Here is the number of the coins if/when a rebuy order gets hit that you get. Money to cash out: The money you take out of the market, when the sell order hits, for profit. Profit: Your net profit from the amount you took out vs the amount you invested. Scenarios: Here are some potential scenarios. Most of the time you will not only took profit vs the money you have invested, but also be in profit vs you just hodling. There is only one scenario where just hodling is better (but you would still have the problem with not taking profits): when the price skyrices to way higher levels you estimated and doesn't drop back for more than 67% after that. Be sure to readjust those numbers after every bullrun. You don't want to follow the same numbers the rest of your live. This sheet only works with one full bear and bull cylce. Last note: As i said, this isn't perfect. I'm always open for better solutions and you can apply them into this sheet and share them with me/other people. It's a standart .ods format which works with open office – it can't execute anything. But if you don't want to download it, you can comment here the numbers you want to insert. I will insert them, load up a screenshot and send you the link.